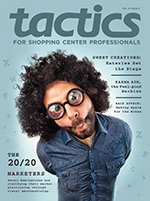 Tactics Magazine | Mall Media Inc. 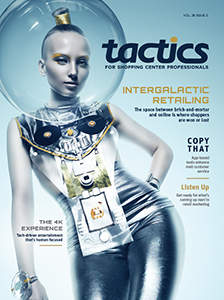 Tactics Magazine is the world's leading shopping center trade publication with a strong focus on marketing. It caters to professionals responsible for managing and marketing shopping malls, open-air centers, lifestyle and town centers, outlet centers and retail parks, as well as provides a promotional platform for reputable industry suppliers. 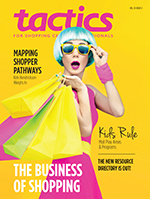 Our readership, which ranges from property-based managers to senior corporate executives, has proven purchasing power across all areas of shopping center management—creative design, media planning, leasing, market research, decor, sales promotion and events, signage, digital marketing, operations and customer service. 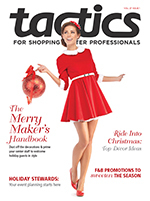 Tactics Magazine's online platform features new editorial content every week and substantial archives, while four annual special print editions offer an in-depth look at topics that are central to the management and operation of commercial real estate properties: Technology, Holiday Marketing, Shopping Center Business, and Advertising. 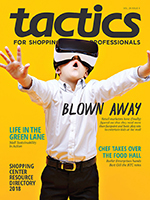 Together, the Tactics Magazine website and print editions inform, inspire, and connect retail real estate professionals. The 20/20 Marketers: Whether you take a short or long-range view, be clear on your center’s brand representation.